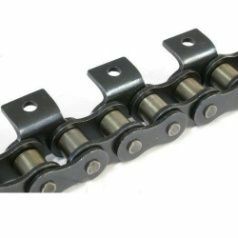 We manufacture Roller Chains with different types of attachments viz: A-1, A-2, K-1, K-2, or as per customers requirements, with best workmanship using skilled labours. Our chain quality and finish is outstanding. Our chains are made from good quality metal to provide longer life. Our Chains are used in many Industries such as food, chemicals, engineering, pharmaceutical, bottling, etc.